Seagate Technology, launched its advanced 14TB HDD portfolio, enhancing the company’s enterprise and speciality drive portfolio. Consisting of IronWolf® and IronWolf® Pro for network attached storage (NAS) applications, the BarraCuda® Pro desktop drive, surveillance-optimized SkyHawkTM, and ExosTM X14 for hyperscale data centers, this purpose-built portfolio empowers customers to consume, manage and utilize digital data more effectively and efficiently while establishing new benchmarks in speed and capacity. With this offering, Seagate continues to lead the industry in driving data storage technology toward a lower cost per terabyte through hard drive optimisation, the versatility of application, and unmatched capacity. Whether for personal use, creative and design computing, online gaming, or large-scale surveillance systems and hyperscale environments, Seagate drives are opening up new data management opportunities across a wide range of markets. IronWolf and IronWolf Pro drives have continued to push boundaries for NAS applications, providing best-in-class reliability and performance for always-on environments. Trusted by the world’s top NAS vendors, IronWolf drives are built with multi-user environments in mind, which allows a workload rating up to 300TB/year allowing users to do more with their data and their NAS. The drives are optimised with AgileArrayTM firmware for NAS servers to provide the customer with a host of benefits including RAID performance, dual-plane balance, rotational vibration (RV) sensors, advanced power management and error recovery control. Creative professionals, small businesses and IT staff all have a need for large amounts of data to be delivered efficiently and protected properly. 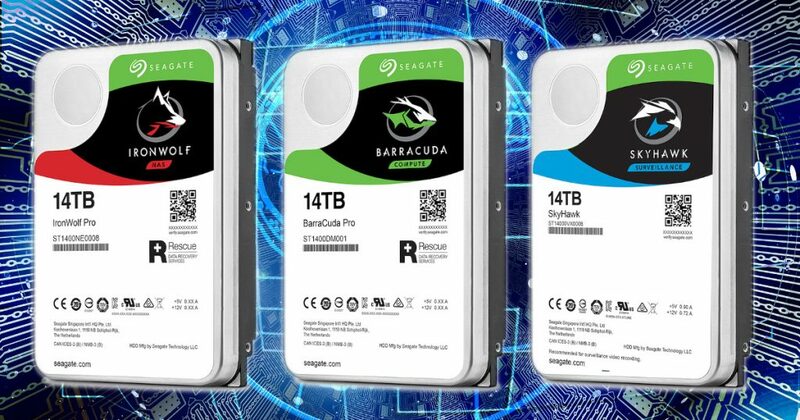 The BarraCuda Pro provides industry-leading 7200 RPM spin speed, along with 250mb/s data transfer rates and up to 256MB of cache, the highest available today, powered by Seagate’s Multi-Tier Caching TechnologyTM (MTC), delivering effortless performance in a massive 14TB of storage. Whether it be the data-intensive editing of 8k video or the transfer of large files to an attached backup, the BarraCuda Pro gives customers speed, versatility and durability at an affordable cost, as well as the support of a 5-year limited warranty. The surveillance industry is rapidly evolving, and the demand for higher video resolution, analytics, and longer retention requires much higher storage capacities. Seagate SkyHawk drives provide the optimum combination of performance, high capacity and reliability, the three most important needs for surveillance customers and integrators. With the ability to store over 9000 hours of HD video and up to 64 HD cameras,** the SkyHawk 14TB is optimised for DVRs and NVRs, tuned for 24/7 workloads, and equipped with ImagePerfectTM firmware to minimise dropped frames and downtime. Supported by a 3-year limited warranty, customers can also benefit from unique SkyHawk Health Management technology that actively monitors and analyses drive health, empowering users to prevent, intervene and recover from potential anomalies. Built for the efficiency, reliability and security demands of the world’s most advanced hyperscale data centres, Exos X14 drives offer enhanced areal density to deliver higher storage capabilities in a compact 3.5-inch form factor. Combined with the industry’s lowest power consumption and best performance in its class, the Exos X14 enables data centres to maximise storage capabilities while reducing complexity and operational costs. As the need for hyperscale and cloud storage increases exponentially, Seagate’s new Exos X14 drives deliver 40% more petabytes per rack compared to Exos 10TB drives, while maintaining the same small footprint. The helium-based Exos X14 also provides a 10% reduction in weight versus air nearline drives, and flexible formatting for broader integration options and support for a higher number of workloads. Exos X14 also ships in a modular enterprise system (Exos E 4U106) for easy scaling up to an unprecedented 1.4PB density. Tagged Seagate. Bookmark the permalink.